Darwin’s theory of evolution states that variation of the shape and pattern of the adults rather than the embryos are the basis for natural selection. In order to understand how morphological variation arises, it is important to identify the genes that control the development of adult shape and form and their role in the formation of body patterns of animals. 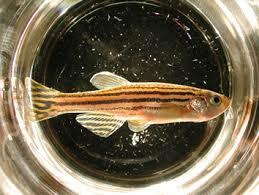 The zebrafish is a vertebrate model organism in which many aspects of development can be analysed by genetics. We are investigating the formation of the adult structures that arise during juvenile development with the aim to understand the genetic basis of morphological variation in evolution. We are focusing on the striped pigmentation pattern of the adult zebrafish, this pattern is distinguishing even closely related fish species. Many genes have been identified by mutations that affect the adult body pigmentation pattern in various ways. All pigment cells are derived from the neural crest, an embryonic population of pluripotent cells that migrate out from the nervous system early in development to give rise to many different structures of the fish including peripheral nervous system, and Schwann cells covering nerves. We are searching for the stem cells from which the adult pigment cells are originating. The stripes decorating the adult zebrafishes are composed of three different pigment cell types: black melanophores, yellow xanthophores and silvery iridophores. Stripe formation depends on an interaction between the three pigment cell types. We investigate mutants in which this pattern is disturbed in order to understand the molecular basis of the interaction of the different pigment cell types in the formation of a striped pattern. Our work may help to gain an understanding of the evolution of beauty in nature.